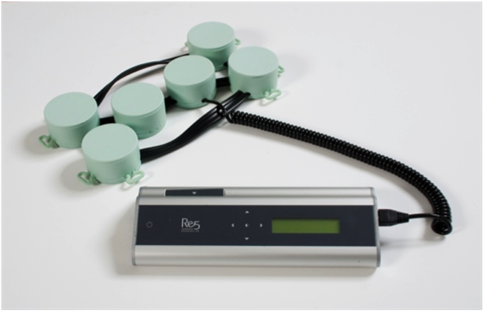 Re5 (the product) consists of a pulse-generator and a set of coils, which transmits electromagnetic pulses to the selected part of the body. The coils deliver electric pulses into the tissue of the body. These pulses mimic the changes in electric potentials recorded outside excitable tissue. The electric fields introduced are so small that they cannot be sensed by the patient.